Daryl Powell has spoken about the pride he had in his players as they overcame adversity to beat Wigan Warriors. 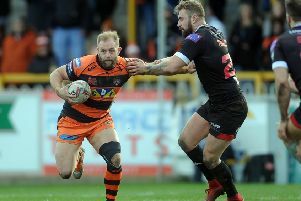 The Tigers had 11 first team players missing, were down to three subs for most of the second half with Jy Hitchcox off injured and down to 12 men late in the game after Matt Cook was controversially sin-binned, but still toughed it out to win in dramatic style with Jamie Ellis’s deciding drop-goal. “It was a big win for us,” Powell told the Express. “The adversity, being down on players - 11 were missing and all would be in our top 17 so that’s a big loss in terms of personnel. “I just thought we were fantastic. Our effort, commitment, determination, never-say-die attitude, the way we stopped the drop goals and then managed to get one ourselves. “Ultimately I thought our second half performance in particular was excellent. First half we didn’t quite play the way we wanted to, but we addressed that at half time and straight from the off in the second half I thought we were the better team. Until Sam Tomkins decided to sin-bin Matt Cook we were pretty much in control. Powell praised the part played by the Tigers fans who raised the volume in the second half. He added: “They did get behind us and when we got the momentum they sensed it and went with us.